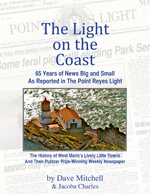 Last night I went to bed in good humor after reading your blog Posting 203, recounting the old stories from The Point Reyes Light about owners who had trained their dogs to drive, run lawn mowers, ride bikes etc. During the night I had a visit from my old dog Harmony, who had passed on back in 1986. Harmony was my partner for over 17 years and rarely left my side. “And how would you know that?” I asked. “That’s pretty cold,” I replied. “How can a dog mesmerize anyone?” I asked. And with that she jumped up and bounded out of the room. When I awoke I actually looked around the house for her. Awww…these are so sweet,including the one by Keith Mathews in the comment section. What lucky dogs all. YOU DO NOT LIVE ALONE, I am going to start addressing you, as Dave, and company. Great story. love it, & love you too. HAPPY BIRTHDAY, to you.Linda & Terry too. as your B-day is tomorrow, Hope you have fun, as you usually do. Sparsely Sage and Timely is powered by	WordPress 4.9.10 and delivered to you in 0.634 seconds using 56 queries.